Mortgage Architects is pleased to announce the recent appointments of business partners Varun Chaudhry and Gursharan Dhaliwal as Mortgage Architects’ newest Western Canada franchise in Surrey, British Columbia. As proud owners of Kraft Mortgages Canada Inc., Varun and Gursharan cite “ systems”, “tools and resources” and “the people” as key reasons for joining Mortgage Architects. “We joined MA to follow our dreams of growing a successful Mortgage Brokerage. With MA’s model we were able to find everything we needed. The tools and resources provided by MA will help us achieve our goals at a very fast pace. Last but not least, all the people associated with Mortgage Architects at the time of decision-making were awesome, this making our decision to join very easy. We look forward to many years of success with MA”. “We joined MA to follow our dreams of growing a successful Mortgage Brokerage. With MA’s model we were able to find everything we needed..."
With over 12 years collective mortgage brokering experience between them (as well as holding Life Insurance and Mutual Fund designations), Varun and Gursharan bring strong knowledge, highly-developed customer service skills and professionalism to their respective new roles, positioning them well for continued success. Their most recent affiliation was with TMG The Mortgage Group. 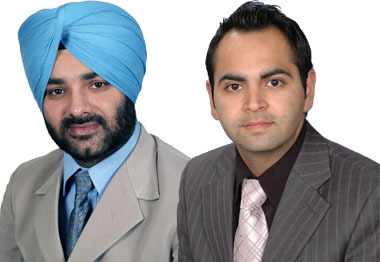 We are honoured and delighted to welcome Varun and Gursharan to our Mortgage Architects Professional Broker Network.